I’d been wanting to catch this guy’s stand-up routine for quite some time. So when I noticed on Computicket’s website that Nik Rabinowitz was coming to Joburg, I was thrilled! I heard him first on the Redi Tlhabi show on Talk Radio 702 where he does his segment, The Week That Wasn’t, every Friday. He is a white Jewish guy from Cape Town who apparently speaks very good isiXhosa. He does the funniest ethnic South African impressions ever! 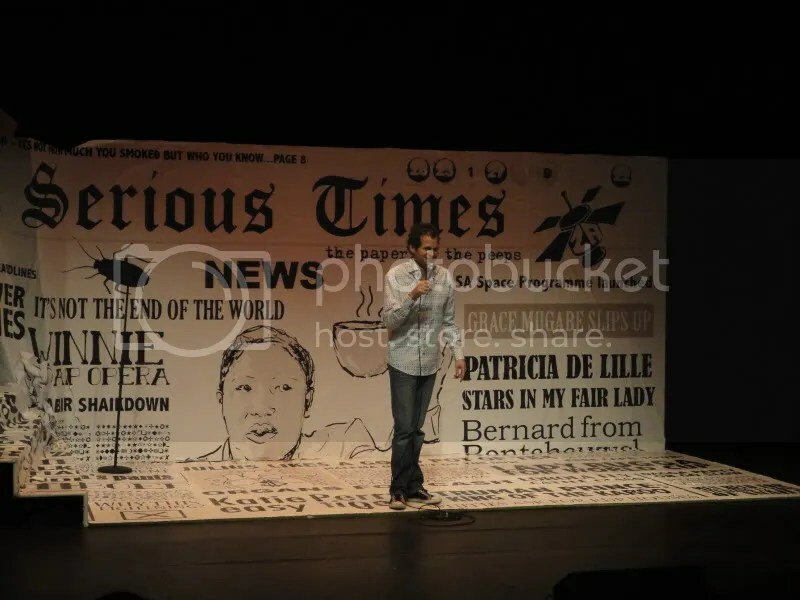 My wife and I saw him on a chilly Tuesday evening, the opening night of his Joburg tour titled “You Can’t Be Serious” and it was absolutely splendid. The venue where we saw him is called The Market Theatre and it is very close to Johannesburg’s CBD or downtown area… not the safest place to be! I was a little unsure about this location especially after our recent bad experience when we attempted to visit the Johannesburg Art Gallery, blissfully ignorant of the shady, decrepit surrounding park it lay in. But this theatre was actually nice. It gave me a very artsy old-time feel, somewhat reminiscent of Nederlander Theatre in NYC where I saw ‘Rent’. As for the show itself, it was hilarious! Nik targeted all the usual suspects like Jacob ‘world-famous polygamist’ Zuma, the notorious Julius Malema of the ANC Youth League, DA’s Helen Zille, Jimmy Manyi, Bishop Desmond ‘tutu-zela’ and practically anybody who has been in the South African news media lately. The best bit was his take on what would happen if the taxi industry really started flying airlines like they have so boldly suggested. We did not necessarily get all the jokes though, since we’ve been living in this country for only a year or two now. But it was not difficult to find things funny in context of his brilliant imitations of people in the news. Overall, we had an awesome evening out with one of South Africa’s best comedians!